Dale Albert Murray was born February 2, 1950 in Cuero, Texas. The six foot four right handed pitcher was drafted by the Montreal Expos in the 18th round of the 1970 draft. His best season in the minors was 1972, when he won 11 games (11-5) posting eight saves, being used mostly as a reliever. The next year he made 23 starts at AAA Peninsula but fell off to 8-13 with a 4.26 ERA. He was brought up to the big leagues in July 1974, finishing off a 4-1 loss to the NL Champion Los Angeles Dodgers. 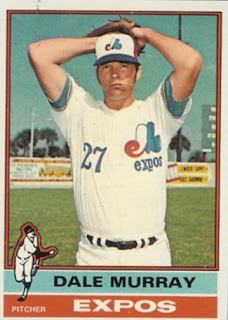 Overall Murray was a pleasant surprise for the fourth place Montreal Expos, saving ten games (7th in the NL) posting a 1.03 ERA in 32 appearances. In 1975 he became one of the league’s top pitchers out of the bullpen, winning 15 games going 15-8, with the ninth most wins in the league. He recorded nine saves, with 43 strikeouts 39 walks, in 111 innings pitched and a 3.36 ERA. From August 16th through the end of the season he was 10-1 with four saves. His team mates saved him four different times with their bats, after he had blown save or win opportunities. He was the winningest pitcher on Gene Mauch’s '75 Expos staff, his wins & saves accounted for one third of the team’s 75 wins. In the bicentennial 1976 season, he led all NL pitchers in appearances (81) while finishing up 55 games (third most in the league). Murray saved 13 games (9th in the NL) for the 6th place Expos, going 4-9 with a 3.26 ERA. In December of 1976, Murray & pitcher Woodie Fryman were sent to the Cincinnati Reds in a big trade for slugger Tony Perez & reliever Will McEnaney. In 1977, now with a better ball club, he was 7-2 with four saves, second out of the Reds pen to (the cap eating) Pedro Borbon. On Opening Day 1978, Murray got credit for a hold, as Tom Seaver pitched his first Opening Day in a uniform other than his usual Mets #41. Murray earned two saves and went 1-1 in 15 appearances through May 17th. 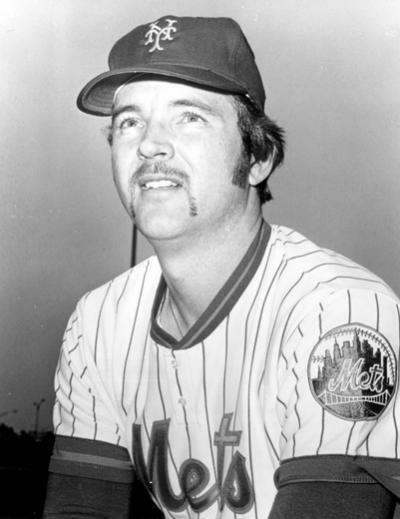 He was then traded to the New York Mets in exchange for Ken Henderson who had only played seven games as a Met. Prior to joining the Mets, Murray was 5-1 with four saves against them in his career. In his first game as a Met he took a loss to the Philadelphia Phillies at Shea Stadium, allowing five runs over two innings of work. Five days later, he pitched three scoreless against the Pittsburgh Pirates to earn his first Met victory. In July he earned a 5-4 extra inning win at Shea Stadium, pitching three scoreless innings against the Houston Astros when Joel Youngblood hit a walk off double off Joe Sambito. From August 18th through the end of the season, he was one of the team’s best pitchers, going 4-1 with three saves, blowing just one opportunity. Murray finished the year at 8-5, with five saves & 53 appearances (both second on the staff to Skip Lockwood). In 86 innings he gave up 85 hits, struck out 37 batters, walked 36 & allowed 35 runs while posting a 3.65 ERA. In 1979 Murray had a rough start, earning a loss in the third game of the season, against the Montreal Expos. He pitched tree inning but allowed a top of the 14th triple to Andre Dawson, which won the game. Overall in April he blew two saves, taking a pair of losses to the Expos. In June & July he was credited with two wins, while earning three saves, but then would go 0-3 in August. In September the Expos bought out his contract from the Mets. He went 1-2 with a save that month for Montreal finishing the year leading the sixth place Mets in appearances (58). Overall in his two season Mets career, he was 12-13 with nine saves & a 4.27 ERA in 111 games. From 1980 on, Murray pitched for the Montreal Expos (1980) Toronto Blue Jays (1981-1982) where he was 8-7 with 11 saves in 1982. He briefly pitched for the AL New York team (1983-1984) & the Texas Rangers (1985) before retiring. Lifetime in his 12 year career Murray was 53-50 with 60 saves, 400 strike outs, 329 walks in 902 innings pitched & a 3.35 ERA over 518 appearances.